During the Second World War the paints employed for the camouflage of British armoured fighting vehicles and vehicles were supplied ready-mixed. They matched two British Standards colour ranges: BS381C of 1931 and BS987C of 1942, together with some non-standard paints for specific purposes. In the Middle East locally produced theatre colours that did not match either of these standards were introduced during 1942-43. 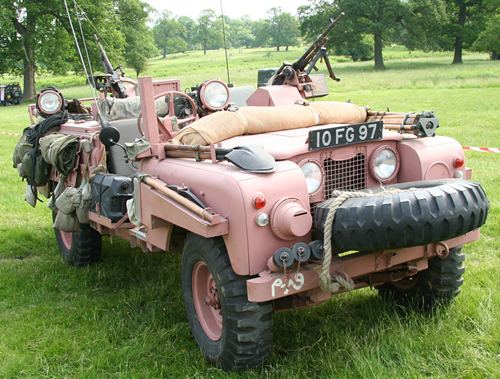 One of the more interesting colours, and the subject of this essay, is an unlikely-sounding Pink that came to be used on small four-wheel drive vehicles by an element of the British Army in the second half of the twentieth century. It was during the Western Desert Campaign of 1940-43 that a young officer of No. 8 (Guards) Commando, Captain David Stirling, conceived the idea of creating a unit of parachute-trained soldiers to operate behind enemy lines. Their role would be to gain intelligence, destroy enemy aircraft and attack their supply and reinforcement routes. Unfortunately the first mission of Stirling’s unit, which later became known as the Special Air Service (SAS), was a failure. Codenamed Operation Squatter, it was carried out in a strong gale and heavy rain. One of the aircraft carrying the SAS men was shot down – all 15 soldiers and the crew were killed. The official report on the mission records that the remaining men were “widely dispersed and demolition material soaked”. However, remembering a successful raid on an airfield carried out by an earlier Commando unit in Chevrolet trucks mounted with .303 machine guns, Stirling turned his thoughts towards the potential of the Jeep for carrying out his deep penetration raids behind enemy lines. 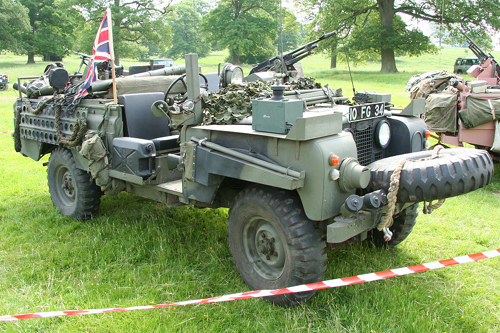 Vehicles obtained by the British Army through the Lend-Lease Scheme were obtained and suitably modified for SAS use. The nickname of ‘Pinkies’ stuck to them even though not all of them were painted in that colour. 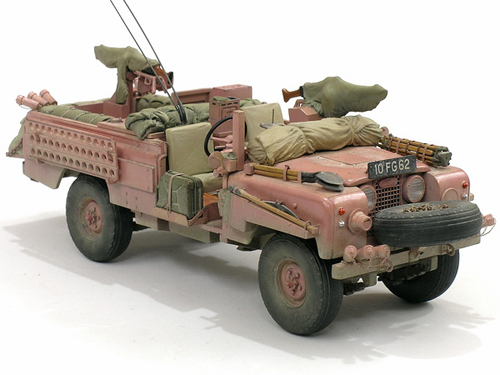 In the mid 1980s the Land Rover 110 HCPU became the SAS’s new Desert Patrol Vehicle (DPV). The DPV had coiled-spring suspension, providing for a much more comfortable ride than its predecessors. DPVs had a wheelbase of 110 inches and were powered by a 3.5 ltr V8 diesel. 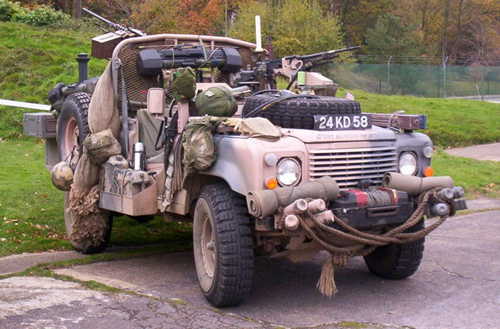 SAS DPVs had mounts for an array of weapons and were configured in a number of ways. They tended to be given a more subdued beige camouflage scheme. I was approached by the National Army Museum for help on the correct colour for the painting of their ‘Pink Panther’. 1 The crews of the jeeps are all wearing ‘Arab-style’ headdress (keffiyeh), as copied from the Long Range Desert Group (LRDG). 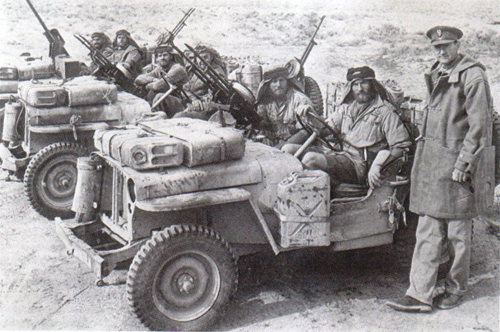 The officer at the wheel of the nearest jeep has a Fairbairn-Sykes commando knife on his left hip, and insignia on his shoulder and left breast, including the operational SAS wings. The jeeps all have modified radiator/condenser systems rigged, and many jerrycans of water and petrol mounted on the bonnet, sides, and in the rear of the body. The patrol commander’s jeep mounts twin Vickers K .303 guns; the central jeep, twin and single Vickers guns at front and rear; and the furthest one, a .50cal. Browning (an aircraft weapon) at the front and twin Vickers at the rear. Note: They are using the American-built Willys Jeeps. Photograph E 21337 from the collection of the Imperial War Museum (collection no. 4700-32). It is interesting to note that during the Second World War there was a short-lived experiment with using pink on naval craft. The colour was known as Mountbatten Pink after Lord Louis Mountbatten a senior British Naval officer. How interesting. Thank you for that. We have had a lot of conjecture recently about the SAS picture displayed here. The second vehicle has an object sitting on the fender of the left tyre. No-one can identify with any certainty. It could be a cover for a single vickers mount or, the most believed theory is that it is a camera case. Any ideas ? Thanks for raising the issue. No, I have no idea what it could be, however it does look like an object placed on it, rather than a fitting. Perhaps a camera case. the box on the left fender is where the radio aerial goes.